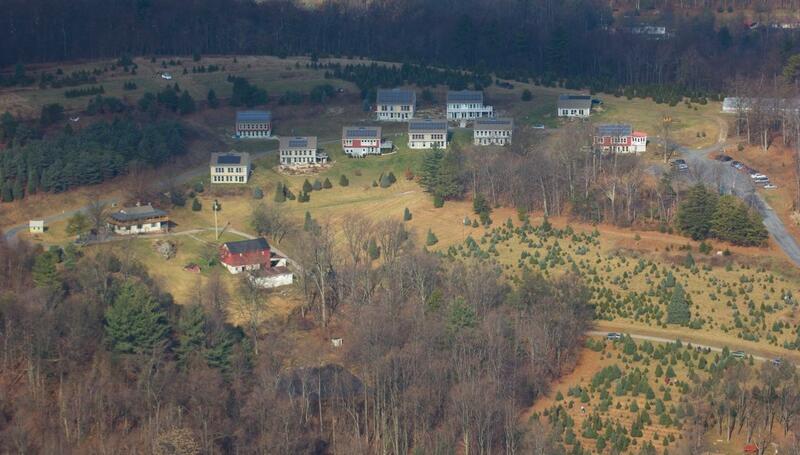 Hundredfold Farm is a 14-household rural cohousing community in the Gettysburg, Pennsylvania, area. The members of this multi-generational community are learning together as they explore the art of living in a sustainable way. The cohousing model is characterized by private dwellings, clustered housing, pedestrian-friendly design, and extensive common facilities. We promote sustainability with organic community gardens, active and passive solar components in our energy efficient homes and an innovative wastewater treatment facility that recycles water to our homes. •	To function together in a rich, supportive manner so that everyone will flourish. •	To provide an alternative to the loneliness that pervades our individualistic society. •	To own and manage the common land jointly, while owning our own private homes. •	To cluster the homes in order to reduce the impact on open space and agricultural land. •	To produce a significant amount of our own wholesome and healthy food using sustainable practices. •	To be a community of tolerance, open to everyone regardless of age, income, ethnicity, sexuality, or family situation. •	An interlacing of native woodland, fields, pond, walking paths, and hills. •	The upper plateau of our 80-acre property offers a 180-degree view of the surrounding area. •	Member-owned working Christmas-tree farm onsite. •	Organic garden plot onsite since 2001. •	Existing eight-room, two-bath historic house with a second-story wrap-around veranda overlooking the pond. •	Our vision for the site includes gazebo, sauna, meditation spots, tree house, and other communal gathering spaces. •	One hour from Harrisburg, Pennsylvania. •	One and a half hours from Baltimore and Washington, DC, metro areas. •	Within a one hour drive of 10 college and university campuses. •	High quality, energy-efficient single-family homes. •	A village concept of the 14 homes balancing the need for privacy with opportunities for spontaneous social interaction. •	A pedestrian greenway between the homes that can be used by emergency vehicles if need be. •	Two convenient parking areas located at the perimeter of the housing cluster. •	All homes are of passive solar design. •	Innovative community waste-water treatment and recycling system.